LAS VEGAS — Twelve hours after the Las Vegas Metropolitan Police Department breached gunman Stephen Paddock’s 32nd-floor suite of the Mandalay Bay Hotel and found him dead, a coroner’s investigator was told they could not remove Paddock’s body because the FBI hadn’t arrived at the crime scene. On October 1, 2017 at 11:20 p.m. Paddock’s suite, Room 32-135 was breached by an ad-hoc team of patrol and K9 officers lead by SWAT Officer Levi Hancock. Upon entry, they found Paddock dead on the floor from an apparent self-inflicted gunshot wound to the head. The experienced detectives from the Homicide Division of the LVMPD, one of the best in the country, were not allowed to investigate Paddock’s death. The hotel crime scene was turned over to the Force Investigation Team (FIT) who was given primary investigative responsibility for the entire investigation. The LVMPD FIT was formed to conduct a criminal investigation to determine whether the use of deadly force was legally justified under criminal law. The FIT also directs the investigation against a subject who either committed crimes which led to the use of deadly force or who has committed crimes against an officer. The LVMPD final police report states that because LVMPD Officer’s Brady Cook and Casey Clarkson were struck by gunfire and Officer Charleston Hartfield who was off-duty attending the concert and was killed, it was those factors that initiated a FIT response. The police report also states that it was decided early on after shooting that the LVMPD’s Homicide Section would handle the documentation of the venue and the 31 bodies found inside the venue and on the exterior perimeter. Homicide detectives worked along with the crime scene analysts and the coroner’s investigators, according to the report. The LVMPD’s Force Investigation Team took responsibility for the Mandalay Bay crime scene, which included the collection of evidence, documentation of the scene, and the collection of Paddock’s body. The police report states that was all completed with the assistance from the FBI’s Evidence Recovery Teams (ERT). FBI ERT handled the collection of all evidence related to the Mandalay Bay and the Las Vegas Village venue. LVMPD officers who spoke to the Baltimore Post Examiner said that the detectives assigned to the FIT are not homicide investigators and that the homicide section conducts the investigation of all homicides, including those caused by an officer’s use of force. The commander of the FIT at the time of the massacre was Capt. Kelly McMahill, who is the wife of Sheriff Joe Lombardo’s second in command of the LVMPD, Undersheriff Kevin McMahill. After the Baltimore Post-Examiner published our October 25, 2017 story, ‘Who is in charge of the Las Vegas Mandalay Bay shooting investigation,’ Capt. McMahill was transferred out of the FIT as her team was actively investigating the Las Vegas Massacre. Macdonald was one of the authors and signers of both the preliminary and final criminal investigative reports on the Las Vegas Massacre. The Baltimore Post-Examiner reported in several stories that both of those reports contained false, inconsistent and misleading statements. On February 9, one week after Clark County Coroner John Fudenberg was ordered by a District Court judge to release the autopsy report of Stephen Paddock, it was finally made public. On January 30, the day Fudenberg was ordered to release the report, he told the judge that he couldn’t release the report because it wasn’t “finalized.” Fudenberg did not elaborate on what he meant by that. When Paddock’s autopsy report was released, the report indicated that the date of his death was October 2, 2017, and the time of death was 12:00 p.m., leading to more controversy. On August 3 when the LVMPD released its final criminal investigative report, attached to that report was the coroner’s investigator’s report which was previously not made public. What does the coroner’s investigator’s report indicate? Stephen Paddock stopped firing at 10:15 p.m. on Sunday, October 1, 2017. The LVMPD breached his suite at 11:20 p.m. and found Paddock dead. Clark County Coroner’s Office Investigator Tiffany Brown’s report states that the coroner’s office was notified by the LVMPD on Monday, October 2, 2017 at 11:15 a.m. Brown was dispatched to the Mandalay Bay at 11:35 a.m. and arrived at 11:55 a.m.
Brown wrote that she found Paddock lying supine on the 32nd floor of room 32-135 of Mandalay Bay Hotel. There were double entrance doors to the room. One of the doors was damaged and off of the hinges. There were multiple holes and defects noted to the door that was off the hinges. The other door had an apparent camera taped where a peephole would normally be. There were multiple rifles and expended cartridge casings located throughout the room. There was a Smith and Wesson .38 caliber revolver bearing serial # CDZ7618-342 found near the decedent. There was a broken window in both rooms. The windows in the rooms were from the floor to the ceiling. The two broken windows were nearly shattered. There were multiple different drills and tools located in the room. Outside the room in the hallway was a room service cart. There were plates on the cart and under a plate was a camera. There was another camera on the cart on the bottom shelf. The cart was positioned in the hallway outside of his door, so the cameras were pointing down the hallway. There were numerous apparent impacts present in the hallway. There were no apparent suicide notes located. Brown goes on to say that Paddock, a 64-year-old Caucasian male, was observed lying supine on the carpeted flooring in his hotel room. She conducted a limited examination. Paddock was clothed in a tan shirt, black gloves, black pants, underwear, white socks, and gray shoes. The gloves were impounded by the FBI. Upon palpation of the head and skull, crepitus [a grating sound or sensation produced by friction between bone and cartilage or the fractured parts of a bone] was noted. There was apparent blood-like substance noted about the face and head. The neck, chest, abdomen, back, and extremities appeared to be unremarkable. There was blanching posterior livor mortis [when the heart stops pumping blood, the blood starts to leave the extremities and pools at the lowest point of the body] noted which was consistent with the position the body was observed in. The body was cool to the touch and rigor mortis [stiffening of the joints and muscles a few after hours after death, usually lasting one to four days] was noted. There were no signs of life present. Brown pronounced death at 12:00 p.m. on Monday October 2, 2017. Brown stated upon arrival to room 32-135 she met with LVMPD Force Investigation Team Detectives T. Alsup and J. Patton who provided her with the aforementioned circumstances. They requested that Paddock’s body remain on the scene as the FBI was responding but they expected that to be several hours before their arrival. The time the FBI arrived is unknown. Brown then departed the hotel room crime scene. 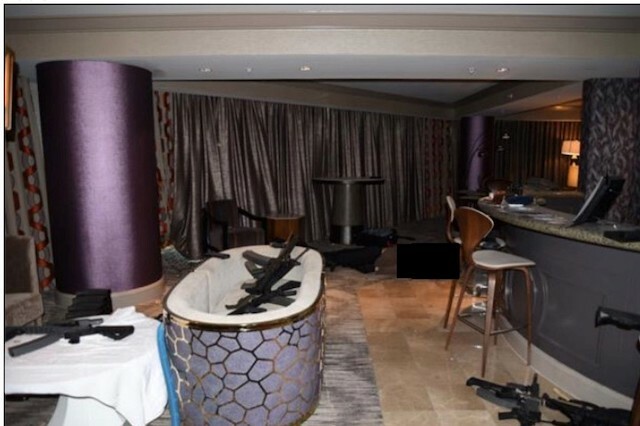 Paddock’s body remained in the room until the FBI and the LVMPD were ready for the removal of the body, according to Brown’s report. At about 9:00 p.m. on October 2, 2017, twenty-one hours after Paddock was discovered dead, LVMPD dispatch notified the coroner’s office that they were ready for the removal of the body from the crime scene. According to Brown’s report, Coroner’s Investigator S. Shields responded along with Davis Funeral Home. Shields conducted a body examination. If Shields completed a report of the results of his examination of Paddock’s body, it was not included in the final police report. The body was wrapped in a clean white sheet, placed in a body bag that was sealed with a corner’s seal and transported to the coroner’s office, arriving at approximately 9:50 hours. On October 6, 2017 the autopsy of Stephen Paddock was conducted. LVMPD FIT Detectives T. Alsup and M. Colon, LVMPD Crime Scene Analyst S. Fletcher and FBI Special Agents R.H. Marriott and G. Kwan were present. Clark County Medical Examiner, Dr. Lisa Gavin ruled the cause of death was an intraoral gunshot wound of the head. The manner of death: suicide. The autopsy pathological examination report, dated October 6, 2017, was signed by Gavin on February 5, 2018, four months after the autopsy was conducted. Law enforcement sources who spoke to the Baltimore Post-Examiner were critical of the LVMPD’s decision to have the Force Investigation Team and not the homicide division detectives as the lead in the criminal investigation. “Homicide detectives should have been running the show inside Paddock’s suite, he was the suspect in the worst mass shooting to date, and it was a disgrace that the homicide guys were not in that room”, LVMPD officers who spoke to the Baltimore Post-Examiner said. Another law enforcement official said that he never heard of a coroner arriving at a crime scene and then being told to leave without taking custody of the body and returning nine hours later to pick the body up. We are all eagerly awaiting what should be a very extensive report detailing the results of the FBI’s forensic examinations of all the physical evidence they recovered, in addition to the Behavioral Analysis Unit’s report on Paddock. Why never a single reference to Charleston Hartfield in all those reports and videos?